As one of the popular and advanced laptop service centers in Chennai, Ram Infotech offers technologically advanced services for laptops like the BGA rework. This service is offered by very few service providers in India, and Ram Infotech has the required skill and expertise to provide the best BGA reworking solutions to the clients. 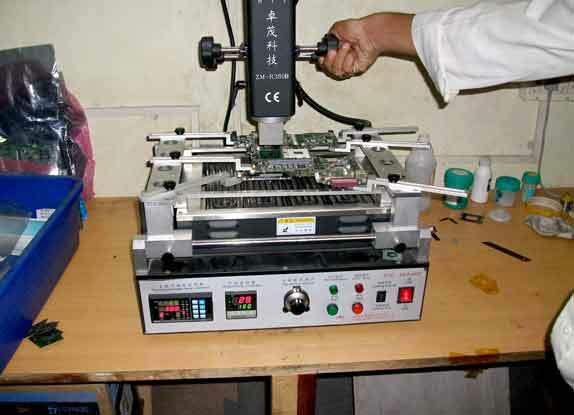 BGA rework needs sophisticated BGA rework station, and Ram Infotech has the necessary infrastructure and skill to provide these high tech services. Some of the technologically advanced laptops have motherboards with BGA IC like intel chipset, south bridge, north bridge, nvidia, ati, and vga ic. When they encounter problems, they need to be serviced and handled differently from the normal SMD ic replacements. As the provider of best laptop services in Chennai we offer the most innovative and advanced laptop repair and services for all our esteemed clients.